Autumn Flowering Higan Cherry Tree is a real eye-catcher! A beautiful, fast growing, mid-sized tree is a perfect addition to any landscape. Flowering multiple times a year, the double-blooms change colors from deep pink in bud, turning light pink fading to almost white when fully open. Simple, lustrous, dark green leaves are oblong to ovate having doubly serrated margins providing fall colors of bronze, yellow, gold or deep red. The pea-sized black, berry-like fruit are not ornamentally significant, but they do attract birds. The Flowering Higan Cherry is a versatile ornamental tree that is quite tolerant of summer heat and winter cold, unlike other ornamental cherry trees. Plant your Cherry Tree where it will receive full sun to partial shade in fertile, moist, well-drained acidic soil. 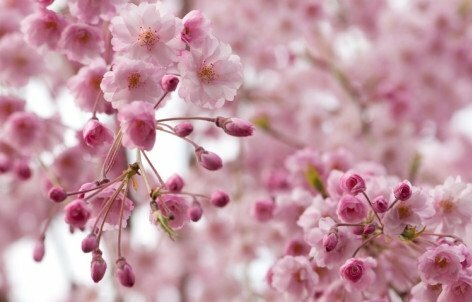 Expect your Flowering Higan Cherry to grow to a height of 20'-30' and a spread of 15'-30'. Hardiness Zones: 5-8 Specifications: Mature Size (H x W): 20'-30' X 15'-30'; Soil: Fertile, moist, well-drained acidic soil; loam, clay; Sun Exposure: Full Sun to Partial Shade; Characteristics: Simple, lustrous dark green leaves providing fall colors of bronze, yellow, gold, or deep red; oblong to ovate having doubly serrated margins; Bloom: Abundance of double-blooms changing color from deep pink in bud, turning light pink fading to almost white when fully open; Fruit: Pea-sized, black, bitter berry-like fruit; Growth Rate: Fast; Tolerance: Summer heat and winter cold. Tip: Potted dormant perennials can be kept in a well-lit cool/cold area (ie. Garage, shed, even in a protected area outdoors) until ready for spring planting. Do not allow them to completely dry out. In winter, plants will be shipped dormant. You are purchasing a Flowering Higan Cherry Trees aka 'Autumnalis' in a gallon trade pot. Ready for immediate shipping! The plants are approximately 18-24" tall with hardy, established roots. Easy to care for and maintain. Great accent or specimen tree, shade tree. Fruits on this tree will attract birds. Images are of mature plants. Mid-sized, multiple trunk, slender, with upright spreading branches and a rounded canopy when grown.